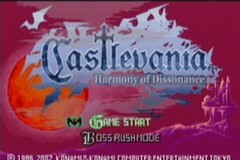 Released by Konami for the GBA in 2002, Castlevania: Harmony of Dissonance yadda yadda Belmont yadda yadda undead army yadda yadda relics yadda yadda Dracula. Best All Bosses time as Maxim with large-skip glitches: Single-segment 0:14:09 by Tobias 'Charleon' Nerg on 2013-09-18. Best time as Maxim with large-skip glitches: Single-segment 0:00:45 by Tobias 'Charleon' Nerg on 2013-08-28. Single-segment All Bosses Maxim with large-skip glitches: 0:14:09 by Tobias Nerg. half a year and I estimate my attempts to be up in the thousands by now. meaning you have to kill every boss to open the door to dracula. If you throw a shuriken, then jump and dive-kick and then attack on the subsequent frames the shuriken will due to bad programming do damage on each frame on the way back to you. This is a pretty hard trick before you get used to it. zip by getting stuck in walls pushing him upwards. for this cathegory, and the crit luck hasn't happened ever. three times while not in drill-form. try is almost unheard of. of him. The reason behind that is that the super hit more times if the enemy is in the middle of the screen, finishing him pretty fast. getting back the lost time used on trying to zip. RNG whether or not he will die in two supers. I was really lucky here and killed him in the middle of the second super. training something into muscle memory here, as it's kinda subpixelperfect. Getting it on the second try is very lucky! (some times it has taken me 25 tries before it let me through). - I got generally medium RNG on Skull Knight. First phase was perfect as i killed him with super, but in second phase he decides to walk out of the middle of the room. You can perform the damageglitch on him on the third phase which is insanely hard, but then you need him to stand still or move backwards. I succeed with this and kinda make up the lost time form the second phase. - I manage to pull off the really swag slightly faster Cyclops kill by throwing a second circling shuriken, really neat! - To get into dracula's room there is a three-pixel window on top of the roof where you need to stand, I find that window immediately!. - Death gave me a pretty good pattern, the only better pattern is if he decides to do his light pillars, because it's much easier to damage-glitch him then. - The way to Talos is pretty much perfect and i get the divekick through the platform in the second room before talos. - Talos fight is really good, although the super could have killed him a bit sooner. - The room before the teleportationdevice is really hard to do smooth if you don't want to get hit, but I managed to pull through pretty smoothly even though i did get hit. - Golem fight is really good, the super hits him pretty well and he gave me good RNG. - The next room holds the second most inconsistent zip in the entire game, and this one gave me really good luck, getting it on the first try! - I get the fast-kill on Merman which is to kill him before he goes into a ball. - I miss The Chapel of Dissonance zip pretty often, but in this run I manage it on the first try. The way to shadow is one of the best one's i've done ever. - I manage to kill Shadow before he morphs to his second phase, which is really nice. - The devil-fight is close to optimal, but I miss the damage-glitch on him, although the super crited so well so I didn't lose much time. - Shuriken glitching Legion saint is really hard because he's so small, but I manage to kill him with TWO consequent glitches! - Double-glitching Peeping eye is one of the rarest things you can do, but this run has it captured! - Having a slight mishap on Pazuzu when the Shinryogi (super) won't come out. The super should have killed him so I wasted a second or two. - Managing to pull off the Swag really fast Minotaur Lv2 kill by doing a shuriken glitch and then activating the super on my way down! - pretty beautiful Minotaur fight, although the second shriken glitch could have killed him. - Regrettably i miss 2 tries to damage-glitch Dracula, which is kinda finicky, but I handle the situation pretty well. Single-segment Maxim with large-skip glitches: 0:00:45 by Tobias Nerg. Castlevania:Harmony of Dissonance is mainly known for the wackiest TAS out there, completing the game in the twenties of seconds. To play as Maxim Kischine, you have to finish the game once as Juste, and then input MAXIM as the name when starting a new game. speed, as this is a speedrun(! ), I use some other glitches to get the damage in. I'd like to start saying that this is almost as fast as a human can do Any%. There are two more tricks that can save time which I'll explain shortly. The start of the run is pretty self-explanatory; you use Maxim's Dashes to quickly get to the opening in the ceiling. During the tower-climb you use doublejumps followed by a space jump (term borrowed from Metroid) to reach platforms and to not lose any vertical speed. You can actually zip up the right wall here to save some time, but setting it up and actually getting the zip is very very inconsistent. I do three hits that will kill the knights, then a short hop up to the ledge. (Which happens if you travel by a speed of about 7 pixels/frame), putting you inside them. Once inside the wall, given how the physics works in this game; you will be pushed upwards. to position myself correctly for a trick used in the next screen. In the next screen I Ascend vertically upwards inside the wall. At the top of the screen you need to time a slide (Down + Jump), so that you get teleported to the right screen once you hit the top. If you don't time it correctly, you will most likely crash the game or end up somewhere where you don't want to be. of your runs will end! Because the whiplaunch into the wall in the save-room is really not that consistent, sometimes it will just deny you passage and you'll remain in the saveroom. I get off a really fast whiplaunch here. So for the next screen you want to divekick SLIGHTLY above the bottom right corner of the screen. The dive-kick is really tight, and being too low or too high will put you in places you don't want to be. Once again we're on a roof and need to proceed as fast as possible to the left. The jump on top of the slightly higher roof is also very precise: Overshoot your jump and you end up in (the treacherous) Treasury, undershoot your jump and you'll need to try again. Once you're at the lefternmost wall just jump and the next screen will push you upwards on top of another roof. Here I use a setup (Two slides, jump + dash right at the same time) so that I end up in the correct screen. the floor and you'll end up outside dracula's chamber! You are out of bounds though, so you'll need to clip inside from below. This happens automatically when you get there for some reason. The actual Dracula fight is a pain; you can have made a perfect run up to this point, only to be mocked by Dracula's RNG and having to reset. on the subsequent frames. This will trigger the shuriken to do damage on each frame back to you. Doing this two times in a row is really inconsistent, but I manage to do so and put Dracula to shame just a short while after, initiating a third Glitch (which happens once in like 2000 runs). but that would be a 1 / 20 000 run, surely. I guess this is the most thoroughly explained 45 seconds on SDA up to date? don't let the seconds fool you; this run is highly execution-heavy and technical, and I hope you will enjoy it! ozzy_88, that made me pick this game up. Kainblox, for being awesome, and the biggest rival to my Any% times. Mapler (Marche_Paladin), for teaching me a lot of tricks.